We had a sunny but windy Duck Waddle Sunday! 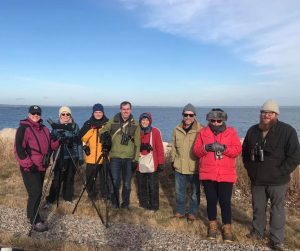 10 birdwatchers found nearly 20 species in just a bit over an hour. Many thanks to the Nasketucket Bird club president Justin Barrett and Carol Molander for leading us around Marion this afternoon. 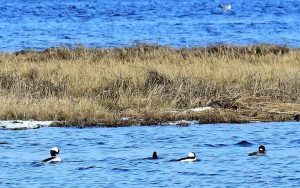 Highlights include Barrows Goldeneye, many loons and a Long-tailed duck. Our list: Great Black-backed Gull, Greater Scaup, Common Eider, Red-breasted and Hooded Mergansers, Great Cormorants, Canada Geese, Common and a Barrows Goldeneye, Bufflehead, Black and Mallard Ducks, White-winged and Surf Scoters, Common Loon, Long-tailed Duck, Ring-billed and Herring Gulls.